Papers: 1934-1962, 1973. 5 inches. 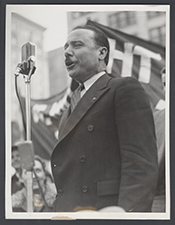 Correspondence and clippings (mainly 1936-1956) on John T. Bernards activities as a labor union organizer, a participant in antifascist and civil liberties groups, and as U.S. congressman (Farmer-Labor Party) from Minnesotas eighth district (1937-1939). Includes material concerning his support of the Loyalists during the Spanish Civil War, his lone vote against the Spanish arms embargo (1937), and his work with the Steel Workers Organizing Committee of the CIO (1937-1942) and with the United Electrical, Radio, and Machine Workers of America (1943-1954). An inventory is available in the repository. Papers: In the Herman Aufderheide Papers, 1933-1949, 0.5 cubic foot. Other authors include John T. Bernard. An inventory is available in the repository. Papers: In the George E. Dizard and Family Papers, ca. 1923-1991, 2 cubic feet. Other authors include John T. Bernard. A container list is available in the repository. Papers: In the Clinton W. Lovely Papers, 1920-1967, 0.5 cubic foot. Subjects include John T. Bernard. An inventory is available in the repository. Papers: In the North Country Anvil Records, 1969-1990, 3.7 cubic feet. Other authors include John T. Bernard. An inventory is available in the repository and online. Papers: In the Susie Stageberg Papers, 1881-1961, 1.25 cubic feet. Papers: In the Al Wroblewski Papers, ca. 1936-1984, 0.5 foot. Subjects include John T. Bernard. An inventory is available in the repository and online.